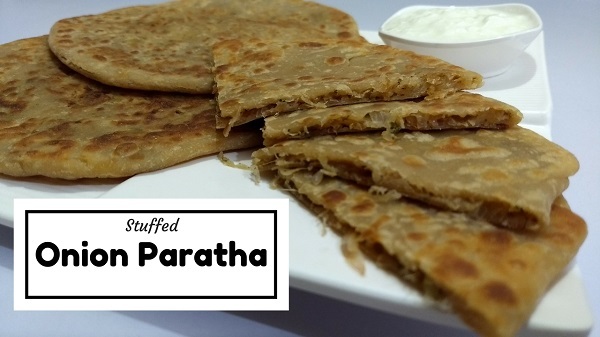 Stuffed Onion Paratha or Pyaz ka Paratha is an easy & quick Indian Breakfast recipe. This delicious Indian Flat Bread is stuffed with the mixture of chopped Onion with added spices to enhance the flavour. Onion Paratha can be served as Breakfast, Lunch or Dinner. Finely chop Onions, add some salt. To prepare the dough, take wheat flour in a bowl. Add 2 tsp. Clarified Butter, Salt and mix well. Keep the dough aside for 10 – 15 minutes. Strain excess water from grated Onions using a cotton cloth. Take dried Onions in a bowl. Add all Spices, fresh Coriander and Flattened Rice, mix until everything is incorporated well. Add some Clarified Butter in the dough and knead again. Dust the dough balls with dry flour and roll into a roti. Add Onion stuffing in the centre of roti. Bring together all the edges of the dough, join them and press gently. Sprinkle some dry flour and roll into a Paratha. Apply some Clarified butter on Tawa and spread evenly using a tissue paper. Place Paratha on Tawa and cook over medium flame. Flip once, drizzle Clarified Butter on top, spread evenly and flip again. Repeat the same process and cook remaining Parathas. Serve hot Onion Paratha with Chutney, Pickle or Curd.